I am mentally and physically exhausted right now. I have never had a move take so much out of me. We’ve never lived in one place for such a long time and 10 years is a long time to accumulate stuff. It’s amazing to me that it’s takes something drastic like selling a house to make you realize that you didn’t do a very good job of living in it while you had the chance. Now that we’ve done all the little repairs we never got around to, decluttered and organized I am really sad to be leaving. The house looks lovely and it’s so much easier to navigate and find things since I’ve taken the time to put everything in it’s place. I’m committed to treating my new home with more care and respect and enjoying every minute that I spend there. I have a lot of regrets leaving this house, our son grew up here and we have a ton of wonderful memories but we always looked at it as temporary and never really settled even though we were here for such a long time. There is nothing like a major life change to make you take a moment and realize that you’ve been drifting through your life not living it. 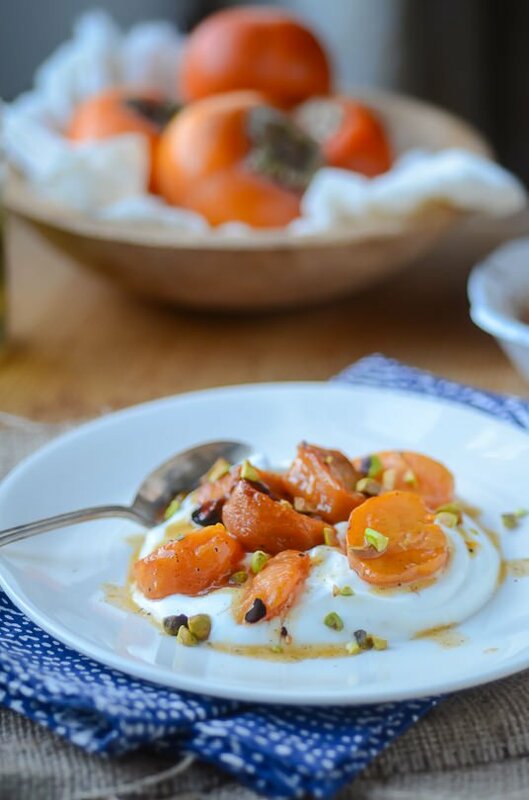 I haven’t had much time to cook lately so I’m sharing one of my favorite simple breakfast recipes that I look forward to whenever persimmon season starts. I love persimmons, I can’t get enough of them, growing up we had a tree in our backyard and I would love to pick them and eat them while they were still warm from the sun. If you have never tried one I highly recommend that you seek some out. They have a sweet perfumed taste with notes of honey and cinnamon and depending on the variety can be eaten like a peach straight out of hand or allowed to ripen until they are extremely soft and fragrant. 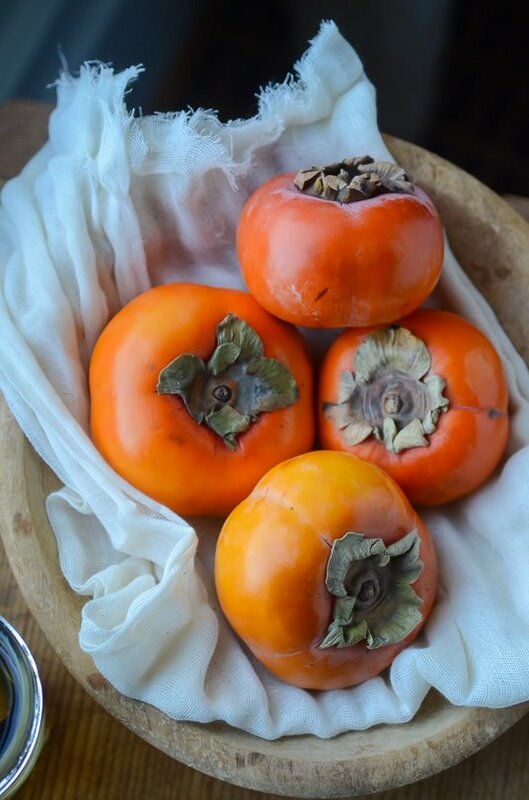 Persimmons are in season between November and February and there are two types, fuyu and hachiya. The hachiyas must be eaten when they are extremely soft or they are extremely bitter and astringent so for this recipe you must use the fuyu variety. You can eat the roasted persimmons hot or cold and I like to make a batch on the weekend to eat throughout the week. Just a quick reheat in the microwave and breakfast is served. I think I’ll go get a batch into the oven right now so I can have some to start the day. Place the honey in a small bowl with the hot water and stir until honey is dissolved. With a sharp knife, split the vanilla bean in half lengthwise and scrape half the beans into the bowl. Reserve the excess seeds for the yogurt. 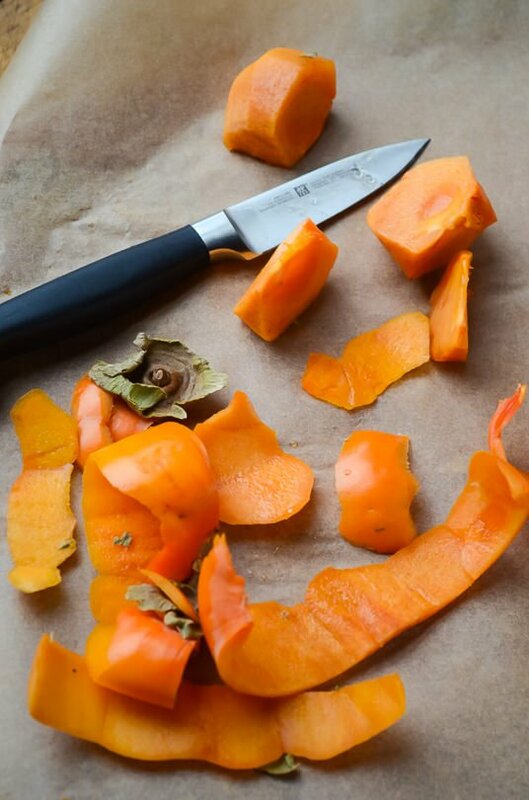 Peel the persimmons, cut them in half lengthwise and then slice them into 1 inch thick wedges. Arrange the slices in a baking dish, drizzle them with the lime juice and sprinkle with the honey mixture, cardamom and butter. Add the vanilla bean to the dish. Roast the persimmons for 45-60 minutes spooning the pan juices over the top occasionally under tender and easily pierced with a knife. Meanwhile, combine honey and yogurt in a small bowl. Add the remainder of the seeds from the vanilla bean; whisk until yogurt is smooth and well blended. Oh, I don’t envy you the work surrounding moving- ugh. I do understand the heartache. Perhaps you could think of the transition as a new beginning… pure potential! The thrill of possibility! It’s so true- one fixes up the house to sell it and then falls in love with what could/should have been. I’ve done it myself. Hopefully, you will be equally (or additionally!) delighted in your new digs and someone new will have as much joy as you did in your current (old) house. I hope the move is bumpless, and I wish you the best in your new home! And, as always, thank you for the wonderful recipe. Just reading it made my mouth water. I am going to try this, pronto. 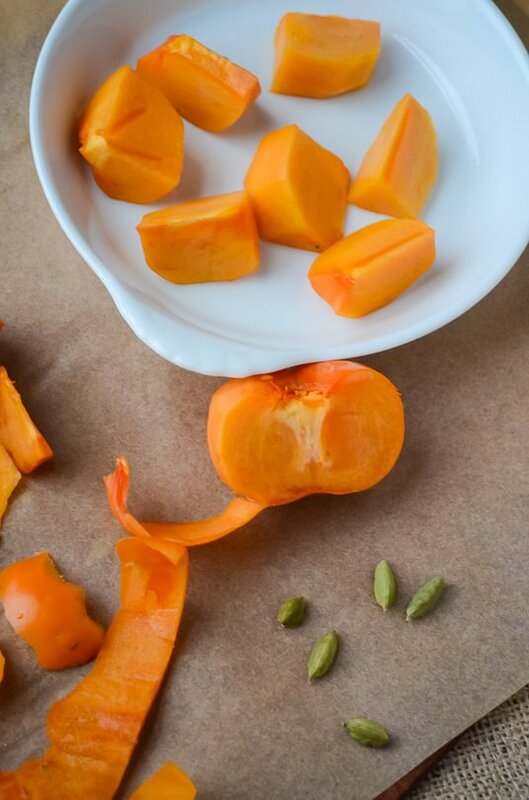 Cardamom with persimmons! That’s brilliant. 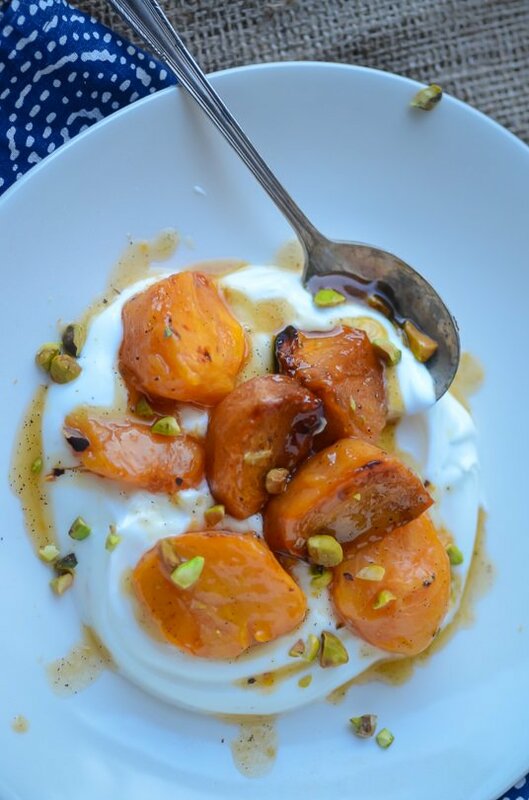 I love persimmons too, especially with cardamom. Now that they’re in season I’m trying to find every possible way to add them into recipes. 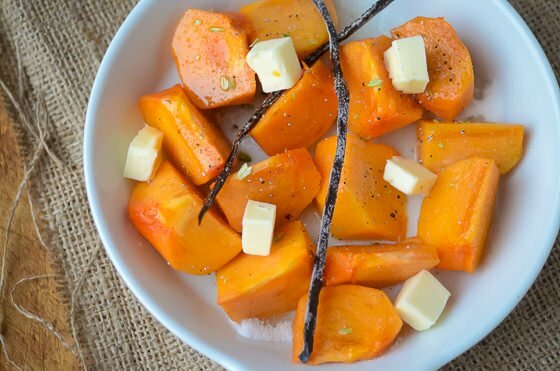 This roasted version looks divine and is very fitting for a cool weather breakfast. Good luck with your move! 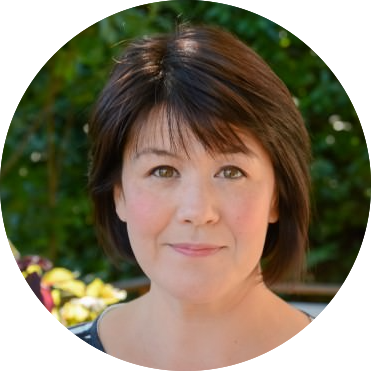 Tina, your site is gorgeous! Good luck on the move and settling into your new house. In the meantime, I’m excited to see this recipe. I love persimmons, eat them like apples and slice them into salads, but am looking forward to trying this roasted recipe. I am so looking forward to a fresh start! 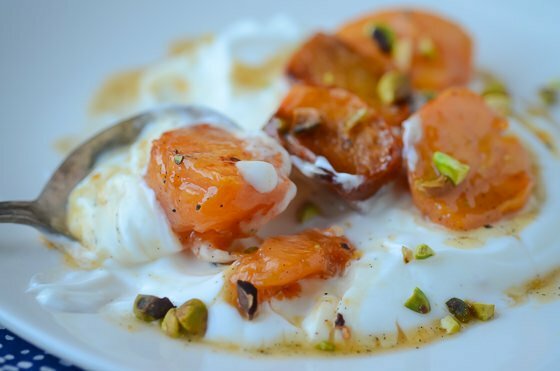 I love persimmons as well, I can never get enough of them when they are in season. It’s one of the things I miss about California, my mom has a huge persimmon tree in her backyard and I would spend all winter feasting on them. I think they pair so well with the cardamom and honey they have such a lovely floral quality that I find irresistible! I hope you enjoy the recipe if you give it a try! Oh MY! Made this today and it simply to die for! I want everyone I know to experience this dish – superb and well done! I’m so glad you enjoyed the recipe. 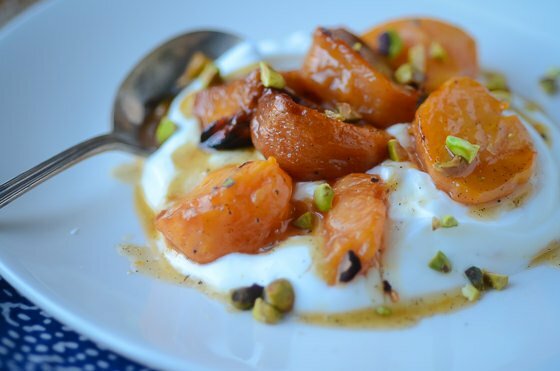 I can’t get enough of persimmons, they are one of my very favorite fruits. Thanks for trying the recipe! I have made this recipe countless times now, and I just want to tell you again: thank you for thinking it up and for posting it! It is utterly and completely delightful. A beacon of light in an otherwise dodgy reality. I’m so glad you’ve enjoyed the recipe. I can never get enough of persimmons when they are in season. Here’s to a better new year. I am about to experiment with your delicious recipe. I will be making the perimmons the way directed and then puting them on top of a Pavlova. Hope it works. Was thinking of added some cranberries. Maybe some ginger. I’ll let you know. Hi Susan, I hope you like them! I’ve got a tree full of persimmons ready for picking so I’m sure I’ll be roasting up a batch this week!